El Bajon del Rio is one of the more popular dives at a landscape of volcanic rocks in the form of toadstools or mushrooms. El Bajon del Rio is a reef in the channel between the Isle of Lobos and Fuerteventura, some 16 meters deep at its maximum. 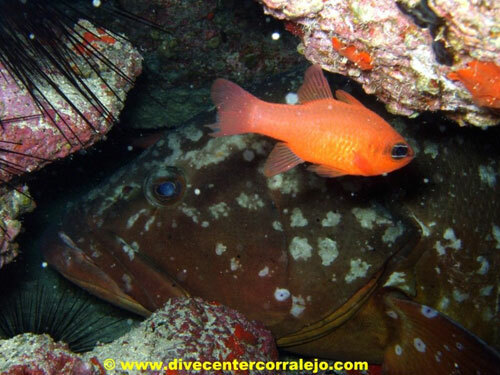 The dive is situated approximately in the middle of the channel; it is reached by boat and takes about five minutes from the port of Corralejo. The bottom is a mixture of basaltic formed volcanic rocks, shaped like huge mushrooms, with loose rocks around the bottom and in between. This dive has besides these strange shaped rocks also a great coral reef and makes the area one of spectacular scenery. The upper part of the mushrooms is covered with colonies of different sponges and brown and green algae. Under the rock formations there are shoals of fish that shine in the sunlight which penetrates the water easily as this dive is a fairly shallow one. Some of the species which can be seen are Black Bream, Zebra Bream, Ornate Wrasse, Parrot Fish, Guelly Jacks, Trumpet Fish, Cow Breams, Saddled Breams, Morays, Barracuda, Blue Fin Damselfish, Canarian Lobsters, Groupers, Amberjacks, Eagle Rays, Sting Rays, Trigger Fish, Scribbled Filefish, Glass Eyes, Angel Sharks and large Scorpion Fish. This is an area of much life. There are, however at times, strong currents within this channel, but it is still suitable for divers of all levels of experience. This dive cannot be dived every day as the timing of tides and currents is very specific.